The 2005 ISVC history synopsis will be uploaded once it is available. The 32 delegates assembled at the County Hotel, Dover, on Sunday 5th June. The hotel was in condition score 1.5 and the management seemed surprised by our arrival. We finally managed dinner and coffee and were ready for the great adventure. It had to get better and it rapidly did. The following morning we boarded the 8.15am P&O ferry for our crossing to Calais. The Channel crossing was glorious and we were soon in France heading towards Ypres in Belgium. We had lunch at Poperinge before progressing to Ypres to meet our guide Raoul for the afternoon excursion. 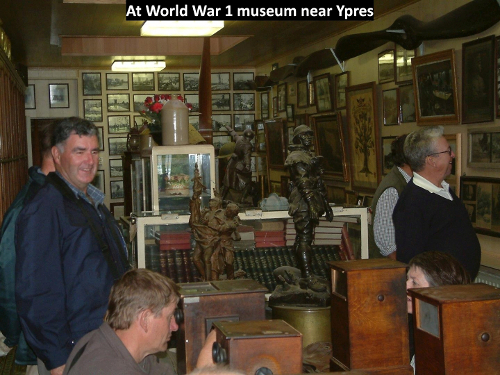 He escorted us to several key battlefields including the Messines Ridge. We saw some original trenches and shell holes and the beautiful but sobering Tyne Cot Cemetery. More than 200,000 British and Commonwealth troops had lost their lives on the Ypres Salient. 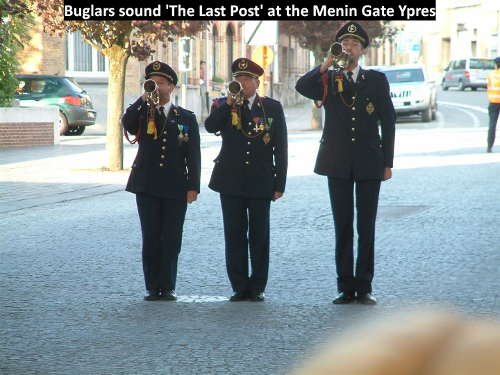 We stayed overnight in Ypres which enabled us to attend the Menin Gate ceremony at which buglers sound The Last Post and which has taken place at 8pm every night since 2nd July 1928. We found both the excursion and the ceremony very moving. One of our party was able to trace a relative who was killed during World War 1, thanks to our guide which enabled her to pay her respects at his grave. The 7th of June saw us motoring to Venlo on the Dutch/German border to meet SVS member Piet Vellema. After lunch we were introduced to landscape management by sheep. De Wassum was a private farm with two holdings. After a film and introduction we were taken to see the sheep. The concept used sheep to graze conservation land (in this case heathland) to maintain its natural state. A set number of sheep were grazed for a fixed time and then moved between sites either on foot or by truck. In addition to grazing, the sheep spread seeds on their wool, feet and through their faeces. Insects and spiders were also distributed on the wool. A full time shepherd (with dogs) tended the sheep during the day and these were then folded overnight. There were several lame sheep which evoked many expert opinions! The heathland had been recreated by removal of top soil and then managed. Many found this a difficult concept when we are always aiming at maximum production through improvement. We then saw evocative photographs of large mobs of sheep moving along roads and through towns. We took our leave of Piet and headed off to Cologne where we stayed the night in the shadow of the famous cathedral. 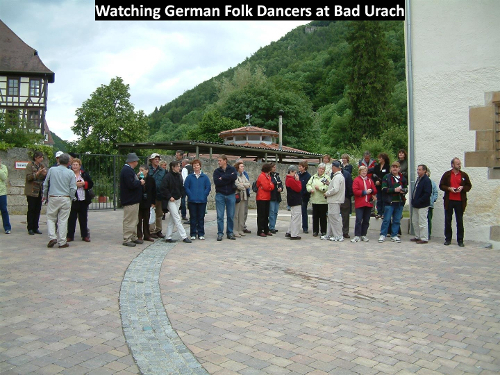 Our destination on the 8th June was Bad Urach at the heart of the Swabian Alb to meet SVS member Heinz Strobel who had organised this part of the tour. 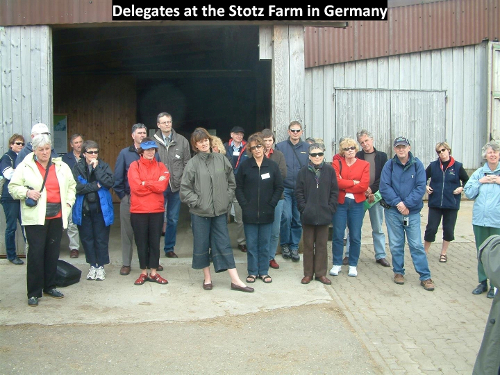 Our first port of call was the Stotz sheep farm. After being treated to a lunch of regional dishes we inspected the farm and sheep. The Stotz family have farmed here for five generations. Transhumance, shepherd education, conservation grazing and on-farm slaughter of lambs with direct sale to customers were discussed in depth. Details such as total number of sheep and lambing percentages were a little harder to ascertain despite careful questioning. Pre dinner we roamed the charming medieval streets of Bad Urach and were entertained by a local folk dance group. Dinner was roast lamb from the Stotz farm washed down with good local beer. The lamb, needless to say, was excellent. 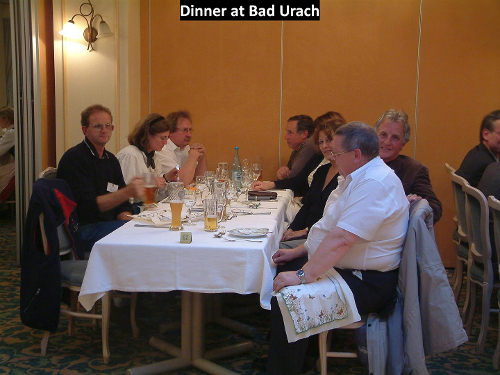 We were joined by shepherds, veterinary surgeons and local dignitaries and were introduced to the Urach Shepherds Festival – a late night! 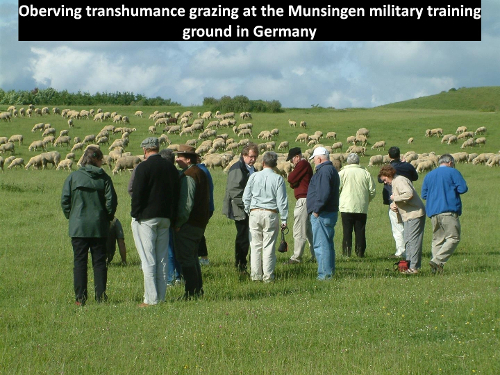 On the 9th June we visited the military training area of Munsingen. This was an area of rolling hills in the Swabian Alb where fifteen large flocks are summered. The land was in the process of being transformed to a biosphere. 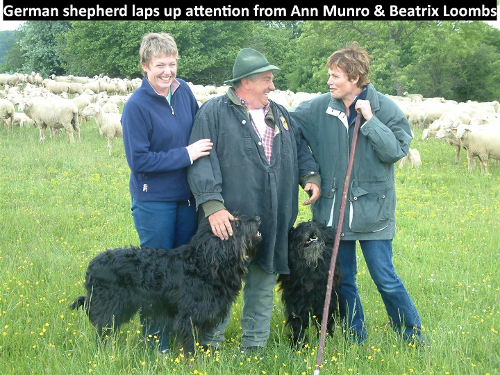 We were then treated to a most interesting sheepdog demonstration using the old type German Sheep Dog. Lack of fencing requires the dogs to keep the sheep out of crops and on the grass verges. The shepherd had a most unusual crook (known as a Schippe or German Shepherds Shovel) consisting of a small triangular spade with a leg crook to the side. The shepherd, with one stick, was able to catch a sheep or very accurately flick a small amount of earth at a straying sheep to bring it back into line. Later Heinz was able to acquire similar crooks for some of the delegates. 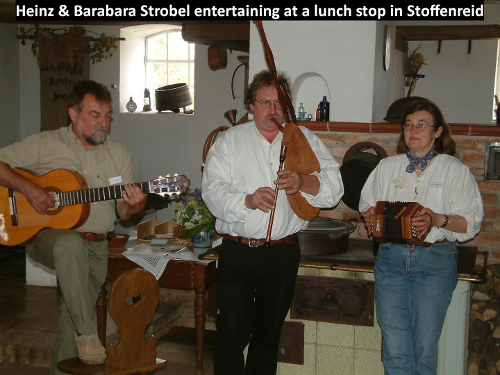 More traditional food was tasted at the Kreisheimatstube, Stoffenried where the Greber family demonstrated wool crafts. This small museum where its lawns were allowed to grow into old style flower meadows with carefully mown walkways gave a glimpse of former rural life. 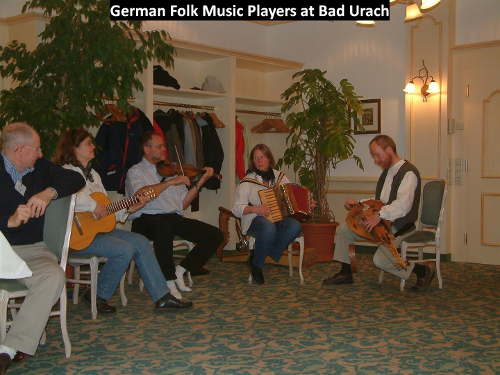 Music was supplied by the Stoffenried Shepherds' Band, two of whom strongly resembled Heinz and his wife Barbara! The next item on the itinerary stated "South German sheep breeds with a cup of coffee". This was an understatement as it turned into a fantastic buffet meal at the Strobels' after viewing sheep from that area. We saw Merinolandschaf (also known as Wurttemberger), Suffolks and other breeds. We reluctantly left Heinz and Barbara and made our way to Munich for the night. 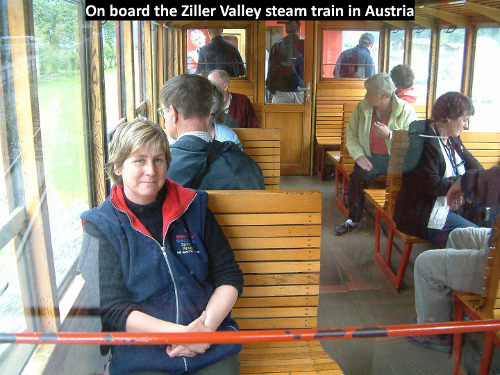 The following day we crossed into Austria and took the steam train up the Ziller Valley to Mayerhofen doing the ‘tourist' trip. After lunch we motored through the Brenner Pass to Verona in Italy where we spent the night before going on to Ancona to board the super fast ferry to Patras. Our coach then returned to the UK with driver Roger Papworth and his trusty sat-nav "Jane". The ferry mainly transported trucks from the north of Italy, down the Adriatic to Greece and two vivid memories were watching trucks being reversed at speed on to the ship and the dense clouds of tobacco smoke wherever the drivers were in groups. 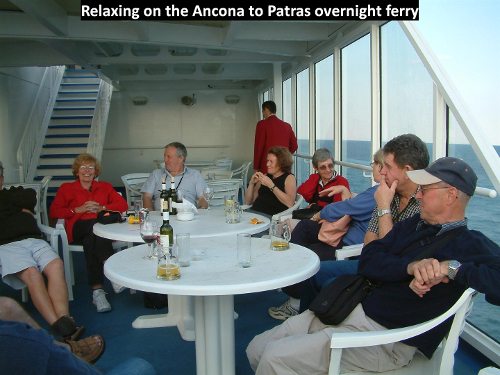 We were on the ferry for nearly twenty four hours, arriving at Patras, Greece, our eighth country in seven days where the coach was waiting to start our next excursion – the pre conference tour of Greece. Sincere thanks go to Chris Lewis and Stuart Liddell for organising the tour and Piet, Heinz and Barbara for their huge contribution. Neil and Ros Cooper, Roger and Jan Marchant, Keith and Joanne Thompson, Bruce and Rosemary Farquharson, Brian and Jan Munro, John and Lois Smart, Stuart and Pam Bruere, Peter and Chick Anderson, Barry and Mary Lou Kemp, John and Liz Plant, Geoff and Rosslyn Reed, David and Angela Hucker, John and Helen Pickering, Chet and Kate Parsons, Beatrix Loomes, Anne Munro and John and Shelagh Daft (tour guides).